We had a visitor from Edinburgh during the week, over to see Paolo Nutini in the Marquee and looking for a quick fix of saline. 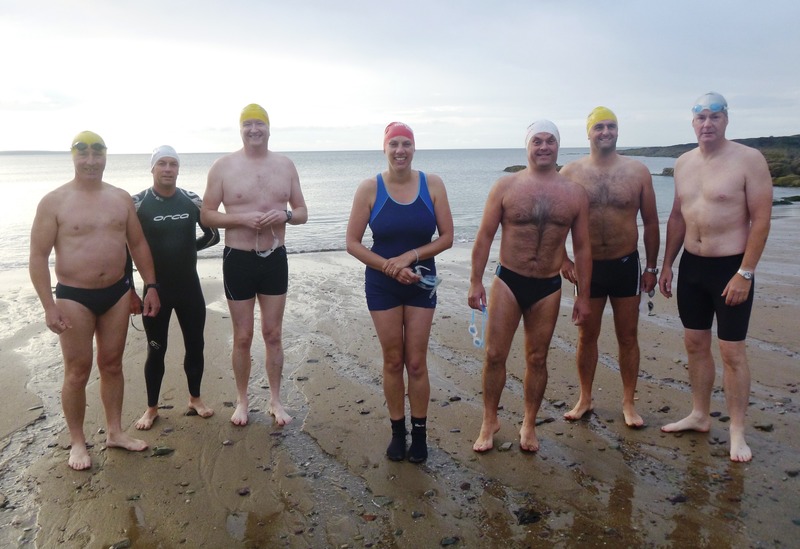 Sarah Morton swims with The Wild Ones, a year-round group based on Portobello Beach in Edinburgh. Compared to the North Sea, she thought our 13c was very pleasant. They have access to showers in a local pool after their swims and have had unsuspecting newcomers faint, coming from the sea and into the hot shower. 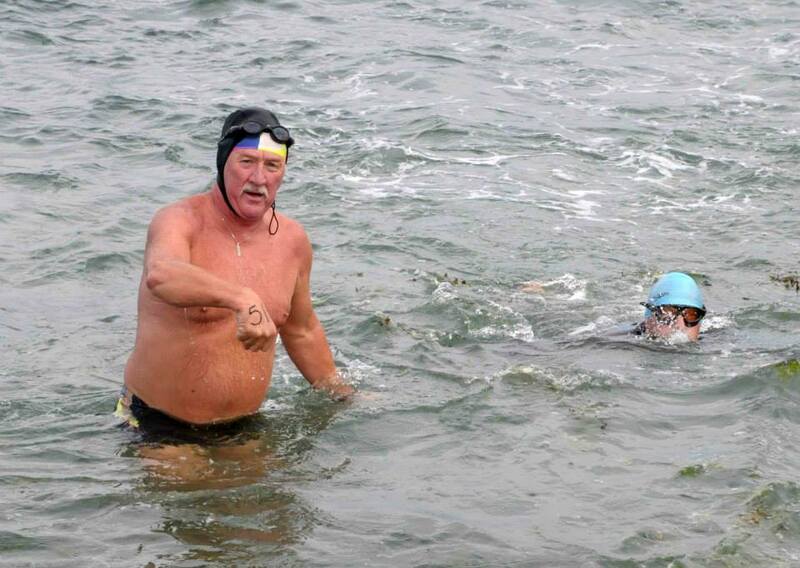 That’s the advantage of having no facilities at our swimming spots here in Cork – no fainting! 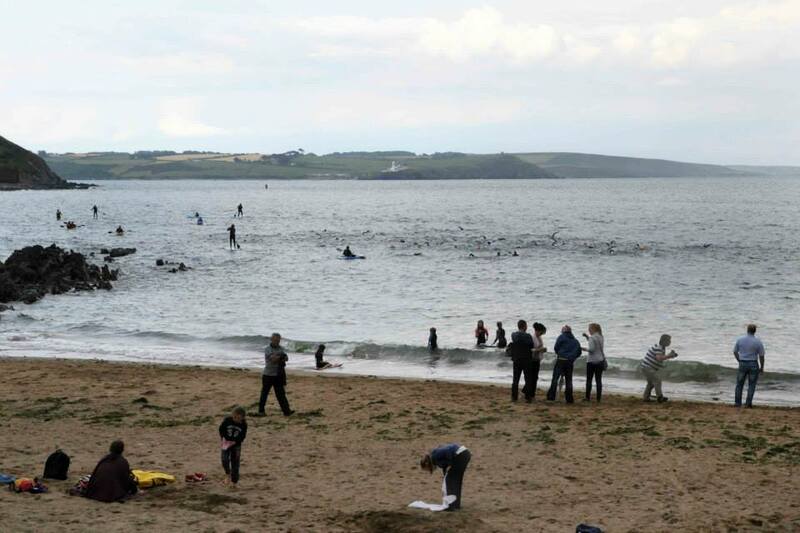 Sarah Morton from the Wild Ones, who swim from Portobello Beach in Edinburgh, takes centre stage on Myrtleville beach. 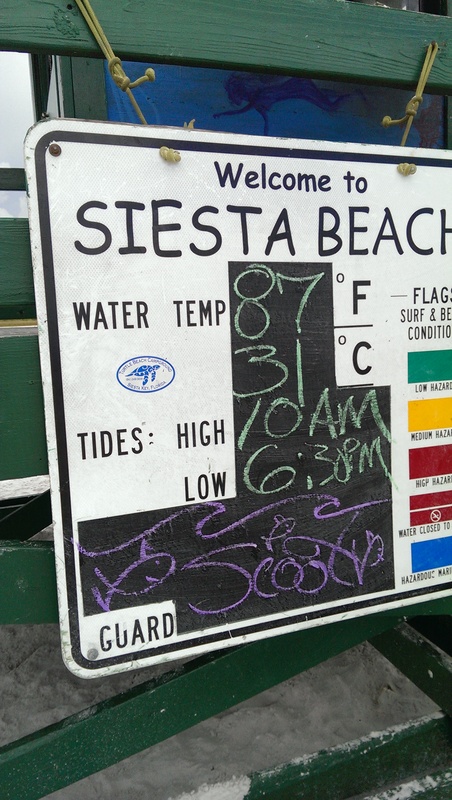 On the travelling front, James Slowey sent provocative pictures from Florida. 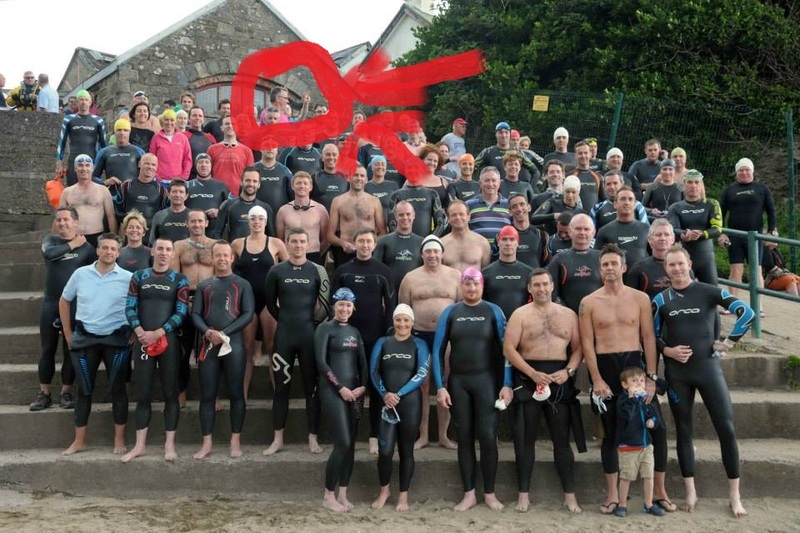 Really, though, the Keys are sooo last year – everyone seems to be there : James, Carol & five more etc etc. It’s like Crosshaven at this stage. 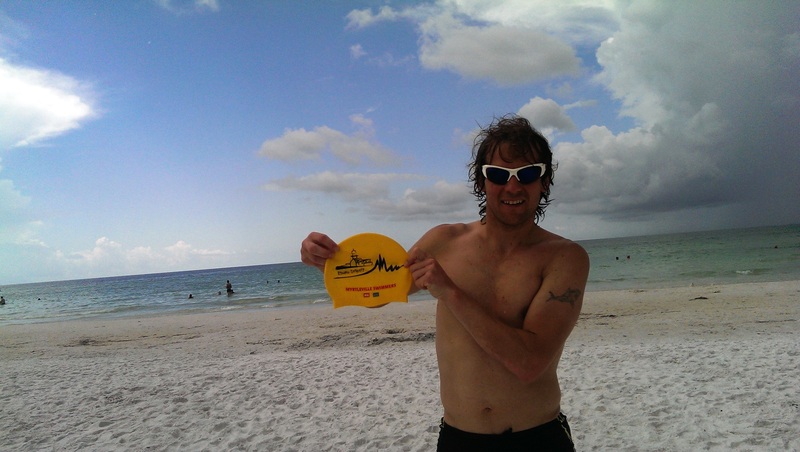 Only 31c in the water on Siesta Beach for Mr. Slowey. Chilly. Fair enough, he’s holding up the Hat, but it might as well be two fingers – ‘I’m on the beach in Floriday, Nah, Nah, Na, Na, Nah’. Good luck to everyone in the Lee Swim today! 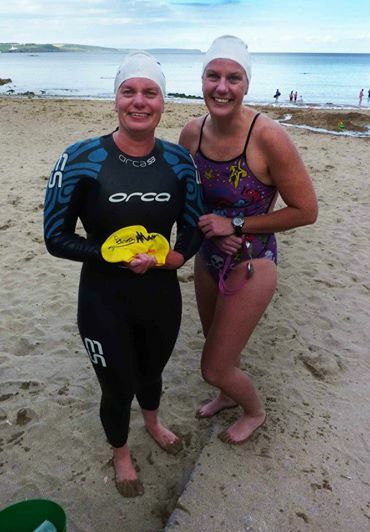 The was a huge crowd swimming last night between 5.30 and 7.30, but Siobhan took a night off to enjoy her own swim – so the only picture was the one below of the Chatting Cashell sisters. Apparently they could be heard from the beach all the way to the Dutchman and back again. They had twelve days of news to catch up on, after Carol’s winning trip to the Swim around Key West. Eleanor & Carol take a break from chatting. NW wind – flat calm. 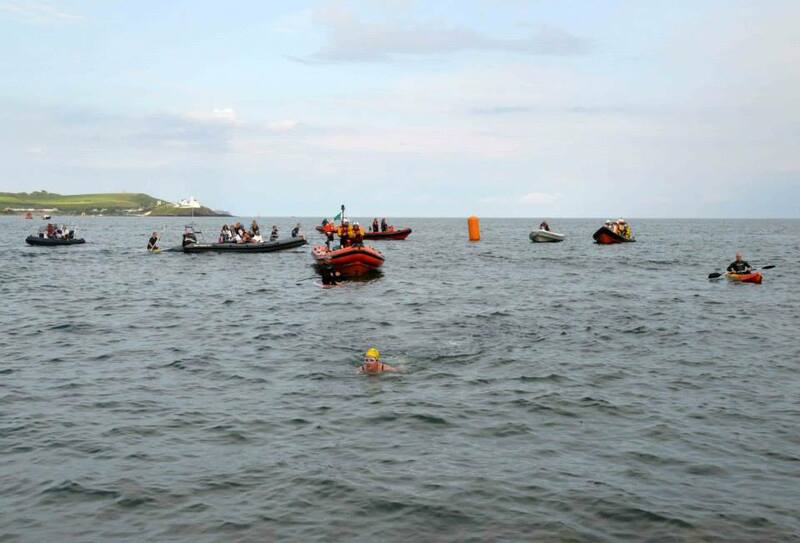 We had really beautiful conditions for the groups swimming at 7.15 and 8.15 on Saturday morning. With a NW wind forecast for most of the week, fingers crossed we should have more of the same. 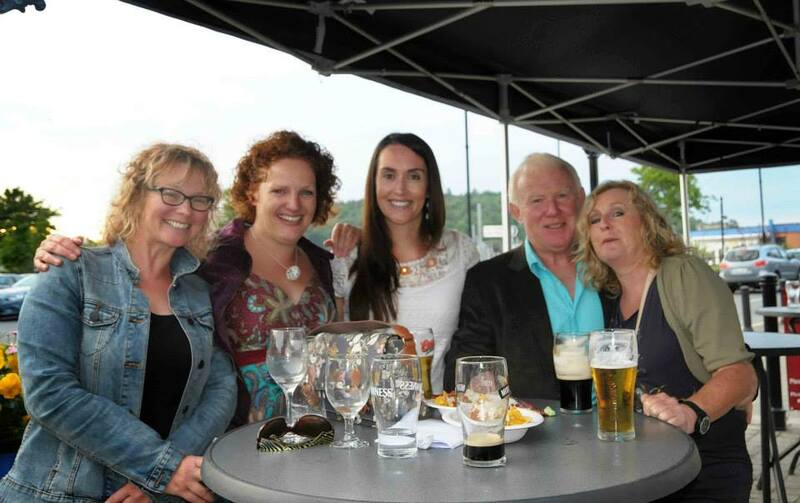 Siobhan Murray, Sean Foley, Breda Maguire & Ruth McSweeney. 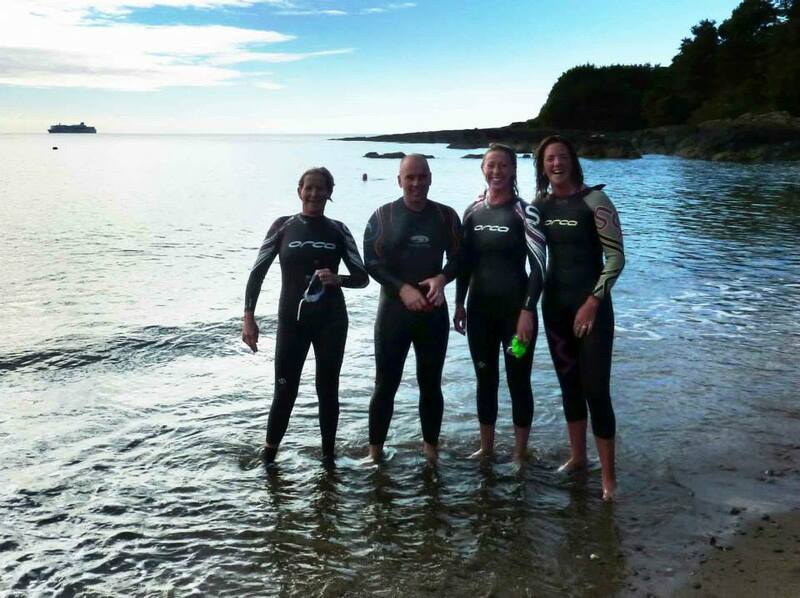 Orca must be making a fortune on ladies wetsuits…. 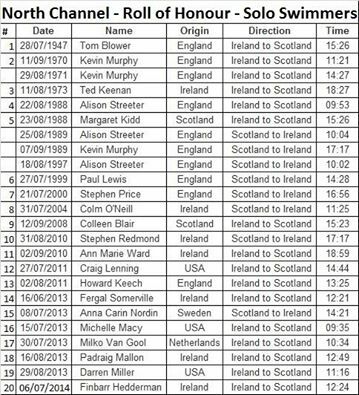 While us mere mortals were enjoying the calm, Finbarr Hedderman took a weekend off from lapping Sandycove and did the short paddle from Ireland to Scotland in a mere 12hrs and 24mins. There was a brief suspicion he was going to break sweat, but the moment passed and he powered on and home. Well done, Mr. Finbarr. 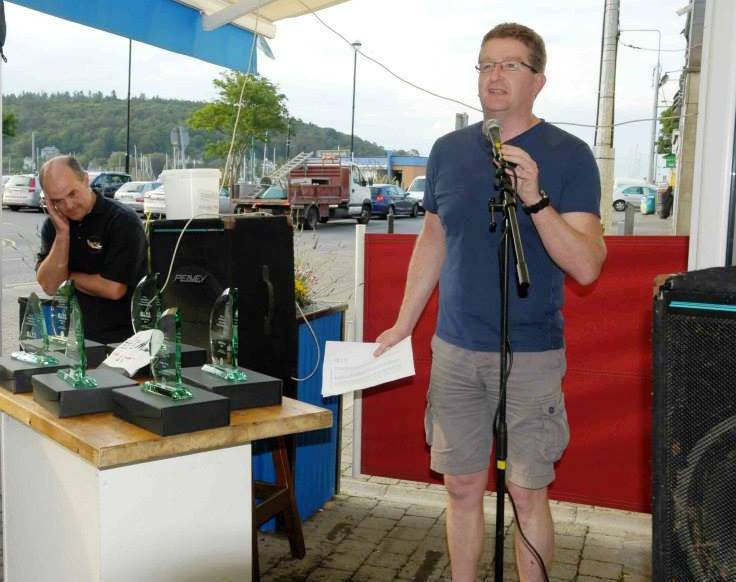 North Channel Roll of Honour – a new addition this weekend. As well as the usual 08.15 swim tomorrow, there’s a group going at 07.15 to do two hours, if anyone is interested in joining. Forecast is for light NW winds, so it should be very swimmable. 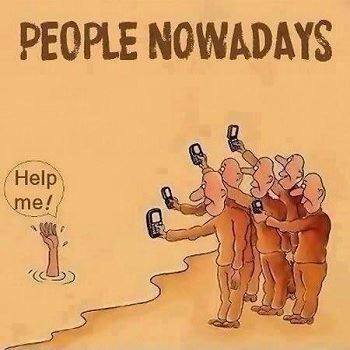 Swim Safe and if someone needs help, don’t fall in to the trap of the modern era. There’s always a different view to be taken of any event. Davy Fitz, for instance, is a great man for always seeing things that nobody else can see – “I’m not complainin’, but dere were tings dere dat happened today dat I could say, but I won’t say, ’til anudder day….”. Well, dis is d’udder day for d’swim. Firstly, take note of the only guy not looking at the camera – we’ll come back to him. Liam ‘There’s always one’ Maher. There have been reports of young fellas on the beach at all hours of the morning lately, being drawn out by the fine weather. 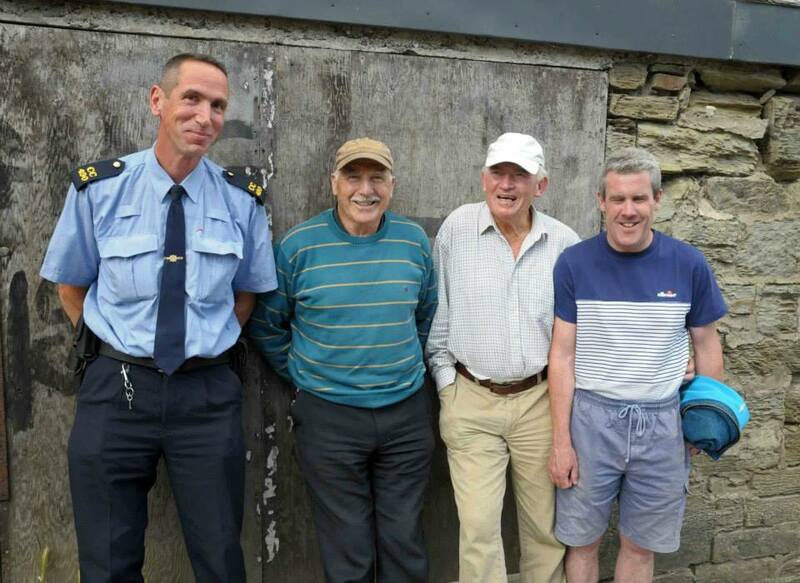 The Gardaí felt obliged to move on information received and cornered some of the suspects at the swim on Saturday. The long arm of the law catches up with early morning revellers – Pat, Tom and Adrian in custody. Safety briefings can be a bit fraught, if people don’t listen. 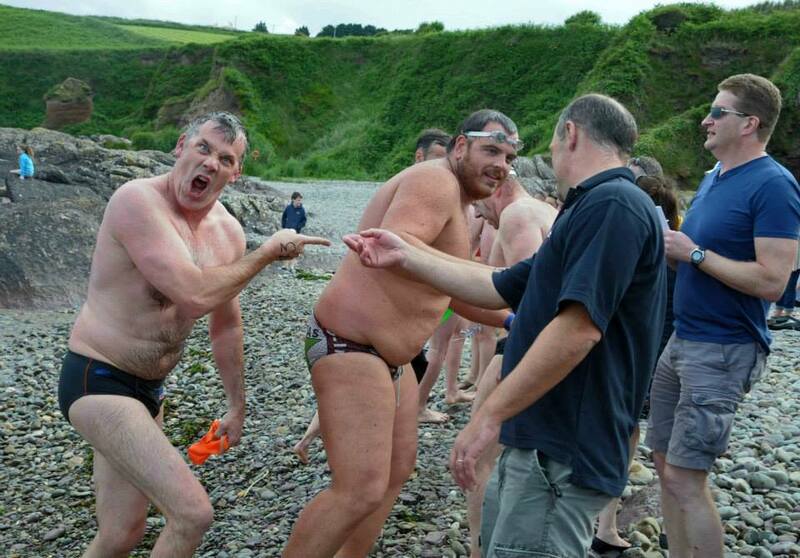 Some stress showed on Mr. Lynch as he tried to get the attention of certain messers looking the wrong way. Although lots of boats had been organised and arrived before the start, apparently someone saw a break of mackerel over by Bunny’s. Sure, you couldn’t miss the first mackerel at the beach, so they all headed that way, leaving only the kayakers to shepherd the swimmers along. Good thing there were so many paddlers. Paddlers in charge of the swimmers as they head for the Dutchman. Boats gone fishin’. 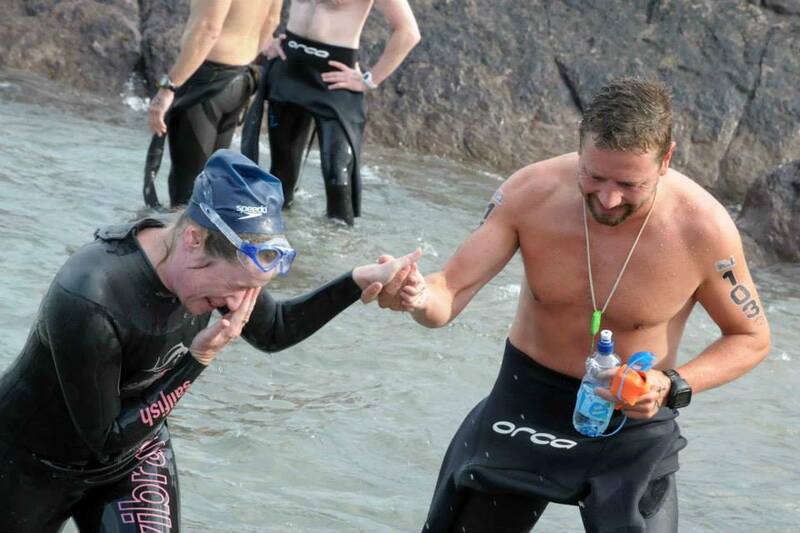 Gentleman Pat helps a lady from the water. 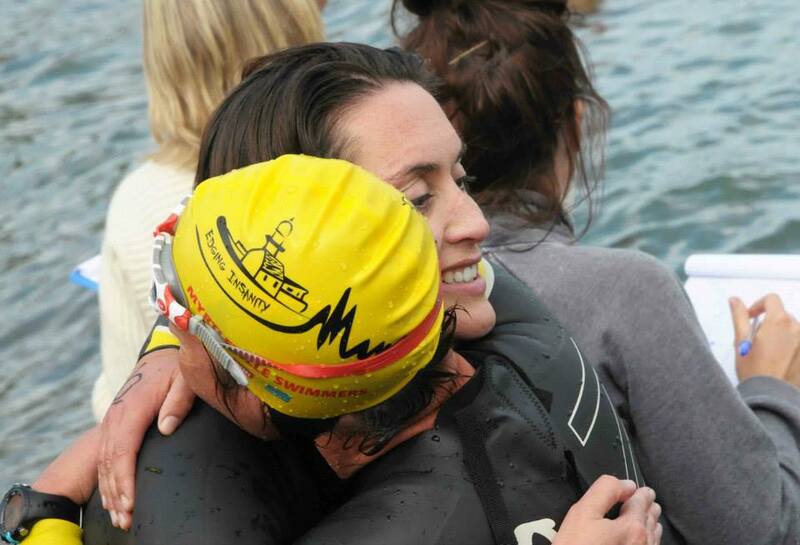 No jokes about this one, just two happy Myrtlevillains delighted with their first-time completion of the swim. 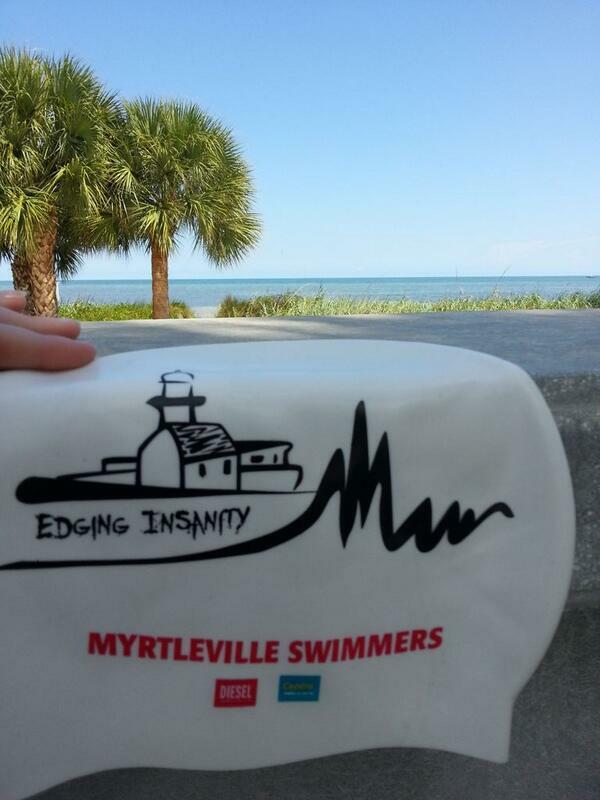 Certain others should take note of this and not get so upset about their swims. Certain others, like this guy. With all his distractions at the start, Liam Maher was still convinced he had the beating of Mr. Finbarr. Picture his delight when he emerged from the water to find Finbarr practically dry and hanging around for the stragglers. Now that’s what it’s all about – ire, spite, begrudgery: great to see. None of this hugging and general happiness needed in the Maher camp. Liam ‘It’s all about the taking part – never mind who wins – as long as it’s not him!’ Maher. It’s fair to say Joleen has enjoyed her swimming this year and has done a lot of it, right through the Winter. 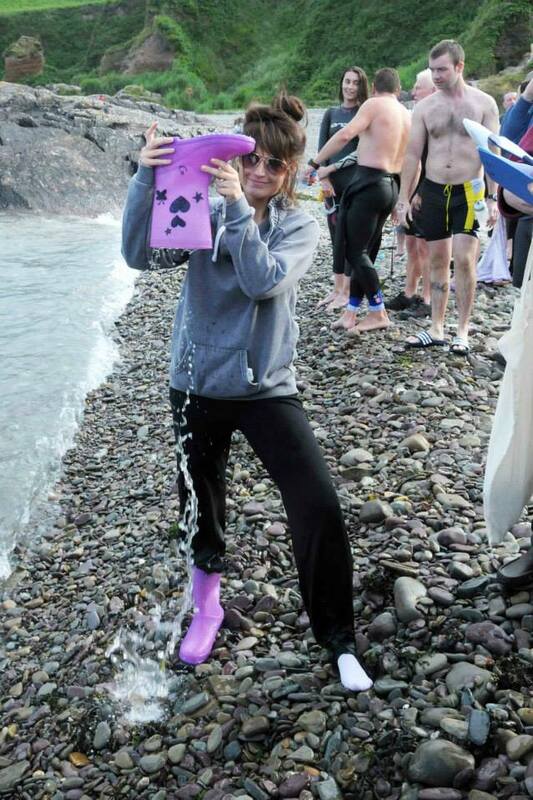 She was having so much fun in the warm water on Saturday she wanted to stay in as long as possible. The safety crews had to gang up and herd her out, to get down to the pub for the presentations. Nobody is going to get left behind at this swim – massed ranks of safety cover. 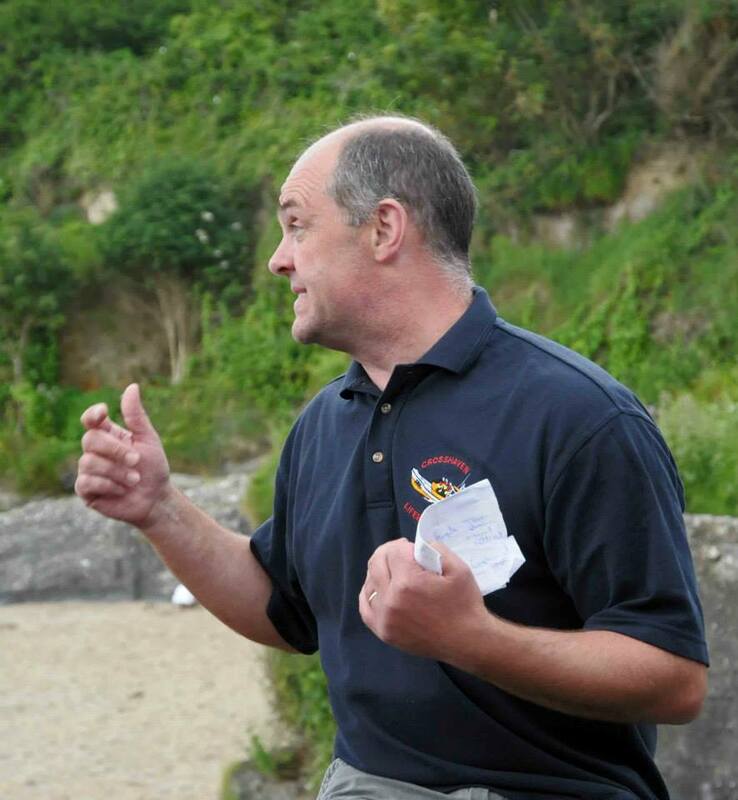 At the presentations, the strains between the organisers were beginning to show. 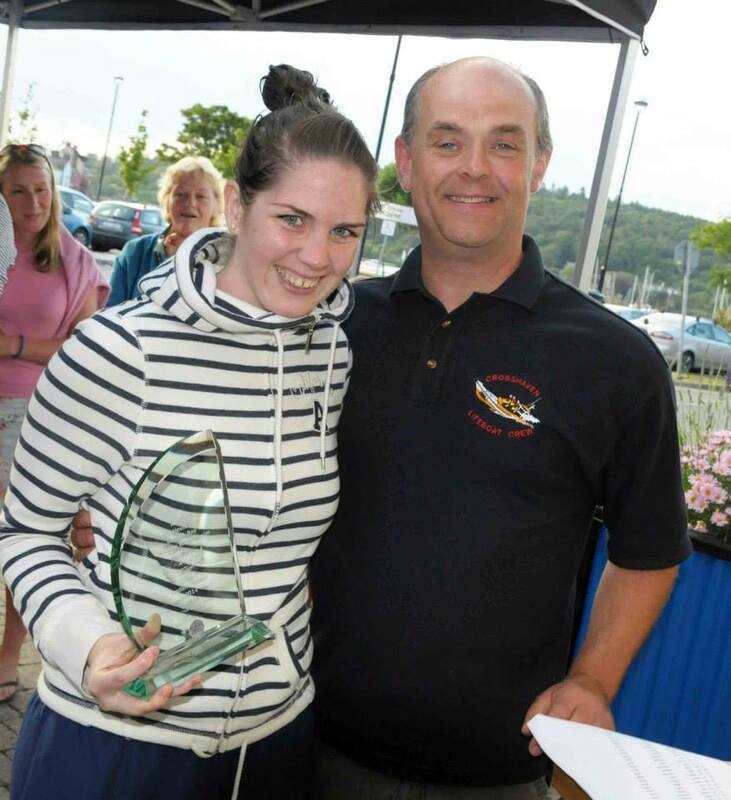 Orla Houlihan was the first lady home but got a text from her sister, Andrea, to say she had been disqualified for wearing the wrong hat and not to bother turning up for the presentation. Fortunately, Andrea just happened to be around to take the prize. You can just tell by Andrea that there’s no way Orla’s ever going to see that prize. Tough luck, Sis! And so to the celebrations and a great night was had, by all accounts. International man of mystery, Denis Cregan-Condon, was resplendent in his jacket and – according to himself – a magnet for all of the women. Best jacket rental he ever did, apparently. Good man, Denis 🙂 Once again, great pictures from Siobhan: just interpreted a bit differently. See you all next year.